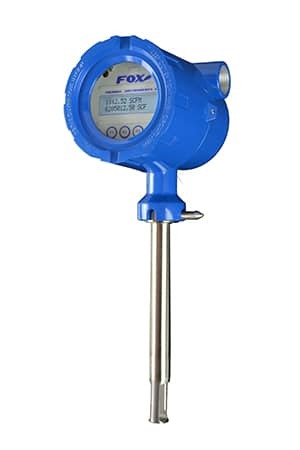 The Fox Model FT1 measures gas flow rate in standard units without the need for temperature or pressure compensation. It provides an isolated 4 to 20mA output (with a HART option) and a selection of pulse, RS485 Modbus RTU, or BACnet MS/TP for a second output. With an optional on-board 2-line x 16-character, backlit display, operators can view flow rate, total, elapsed time, process gas temperature, and alarms. The Fox Model FT2A measures gas flow rate in standard units without the need for temperature or pressure compensation. It provides isolated 4 to 20 mA and pulse outputs for flow rate, and a 4 to 20 mA output for process gas temperature. The pulse output is normally used for totalization. With an on-board 2 line x 16 character, backlit display, operators can view flow rate, total, elapsed time, process gas temperature, and alarms. 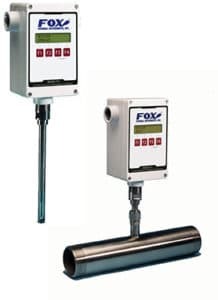 The Fox Model FT3 measures two important process variables with a single instrument, providing isolated 4 to 20 mA and pulse outputs for flow rate, and a 4 to 20 mA pulse output for process gas temperature or a second flow rate output. 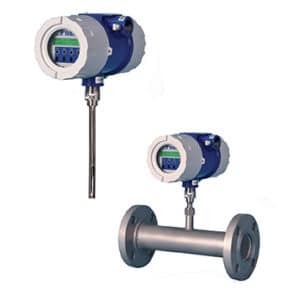 Virtually immune to changes in temperature and pressure, the flow meter delivers repeatable, accurate mass flow measurement under varying loads. The Model FT4A is the newest Fox Meter. It is calibrated with NIST traceable standards and includes our 2nd Generation DDC-Sensor™, CAL-V™ Calibration Validation, and HART or RS485 Modbus options. The Model FT4A is suitable for Industrial, Wastewater and Oil & Gas applications. The Gas-SelectX™ gas menus have been updated to include all upstream flare and vent gases (C1-C9+) required by BLM regulations and API standards.